Children aged 5 and above can also participate! Visitors can enjoy lots of different activities, including snorkelling and relaxing on cruises. 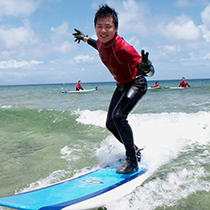 Beginners to stand up paddling are also welcome, so why not come and give it a try? 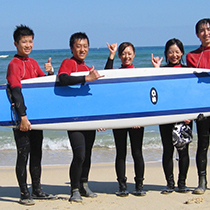 SeanaSurf offers courses tailored to beginners so that those with little experience can enjoy themselves. ※Children aged 5 - 12 y.o. are to ride on the same paddle as their supervising adult. Participants must be aged 5 and above and in good health. ・Approximately 1h30 by car from Naha Airport via National Route 58. ※Starting times vary each day according to the height of the tide. 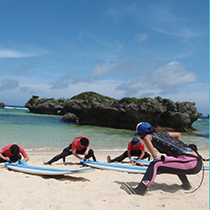 ・For those who are doing the SUP & Snorkelling course, please also provide eyesight. 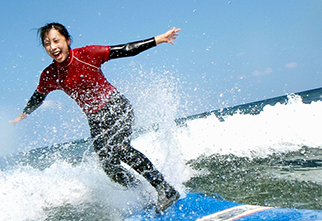 Present the coupon to receive ¥700 off any course at SeanaSurf. Only valid for 1 person.